Hi! My name is Dan. I am the designer, writer and publisher of this Web site. I am passionate about the outdoors, crazy about nature, love good healthy food, cooking, do-it-yourself and working with my hands. Ooops! I love electronics, computers and pursuing real opportunities on the Internet as well. My passions have congealed, or should we say, come together to inspire me to create The Grilling Spot. It is my wish that the pages of this Web site engage, educate and entertain. I solemnly hope to achieve that goal. When I was younger, my parents impressed on my siblings and me the importance of cooking and house-keeping skills. On weekends my Dad would sometimes move the kitchen outdoors. We had fun learning to use firewood to cook. As we got into our teens, we had a kitchen Duty Roaster for cooking and cleaning. I loved the idea of transforming foods by mixing different ingredients and adding spices. 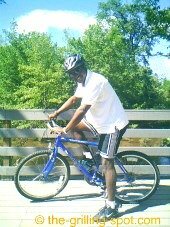 In my late teens, I took camping trips and learned astronomy, first-aid, nature identification and cooking. Anything green and growing, any natural water source, any walking, creeping or flying creature; that was my fun. While camping, we learned Minimum Impact Camping Techniques (MICT). It's a whole concept of leaving no human trace when out in the wild, avoiding unnecessary impact on the environment. Out there, we lived by the true outdoor creed of 'take nothing but a photo and leave nothing but a footprint'. Later on, a perfect storm brewed for me in Tourism. I had already learned French in school up to Diploma Level. I then took up a German language and Tour-Guiding Course and became a Tour Guide. Now, I was able to handle tourist groups on guided tours in cities, towns, national parks, safaris, on the beach and other places of interest. We shared and exchanged a lot in cultural activities, insights and stories. Big fun! On these tours, outdoor cooking for me was the 'in thing'. The sound of crackling burning wood, the night sky, stars? I am home. Cooking in a camp setting, with tourists, for days, has its challenges. The best part is, drum roll please... grilling. 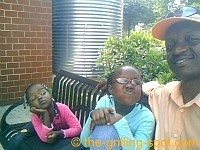 In my touristic escapades, I saw the craziest grill you will ever see! At an internationally acclaimed restaurant called The Carnivore, you can eat all kinds of meat, grilling, at the same time, on this big round charcoal fire in the middle of the restaurant. Believe you me, it is quite a site to behold! It takes a bunch of cooks to man this one grill. My favorite grilled meat is goat. Yum! Goat meat, otherwise known as mutton or 'mbuzi' in the Swahili language. It tastes close to lamb, veal or venison. Mutton is so tender and lean with almost no inter-connective tissue. I like it best grilled medium-rare and served with ugali, a local corn meal and kachumbari, a salsa-like guacamole side dish. All this goes down well with Tusker, a very popular local beer, sold internationally as well. 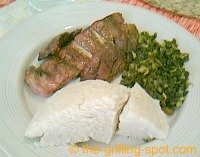 I was given the privilege by a Web Publisher, Gerhild, to write a whole page on how to prepare ugali in the 'Foreign Foods' section of her Web site. You can see it in living color, step by step. I later moved and lived in the storm-ravaged city I called home, New Orleans, or the 'Big Easy'. In the summer of 2005, we all know that 'Katrina' hit landfall. Safely tucked away in Jackson, Mississippi, we encountered either widespread power outages, fallen trees blocking major roadways or destroyed power lines up to 300-400 miles (480-650 kms) away from the eye of the storm. No power, no cooling. Even better, no fuel to cook food at the house of our kind hosts. With outstretched resources, no electricity and very long fuel lines at gas stations, we had to be creative and conserve. Well, we still needed to eat and the sandwiches had become bland and monotone after a few days. We became creative. There is always all this firewood and rocks and animals and fruits and vegetables just laying around all over the place, that we don't always pay attention to. All you need is a few tools and a fire. We survived in a modern Metropolis for seven days in this way during that killer storm, until power and most of the infra-structure was restored. We grilled! The recipes were creative, the food, tasty, the fireside stories, endless. Friendships were started and many more personal bonds were strengthened. A win-win collaborative proposition. I was empowered to bring this story and other grilling pages on this Web site to life on the Internet. How? By skills I have acquired to do this in my own free time and I am doing it the right way. You will see what I mean in a minute on this page called "Keeping It Real". Amazing stuff! When you know, you know. Did you enjoy reading this page? Please let me know your comments, views, thoughts. Please meet these funny little people, my girls. They tutoyer me and also inspire me to reach higher. I hope this about page is informative and fun. I think the 'birth of the grilling spot' page will be equally as informative. Enjoy your visit to the grilling spot. There are many great new things happening here. Take your time, browse and peruse. Nobody's watching. I am glad to have you here!